In January 2003, Apple introduced Keynote, a fairly groundbreaking presentation application. Two years later, along came Pages, a mixed page layout/word processing tool. Together, Keynote and Pages were sold as the $79 iWork ’05 “suite.” Compared to the venerable AppleWorks, though, iWork was missing both spreadsheet and database applications. 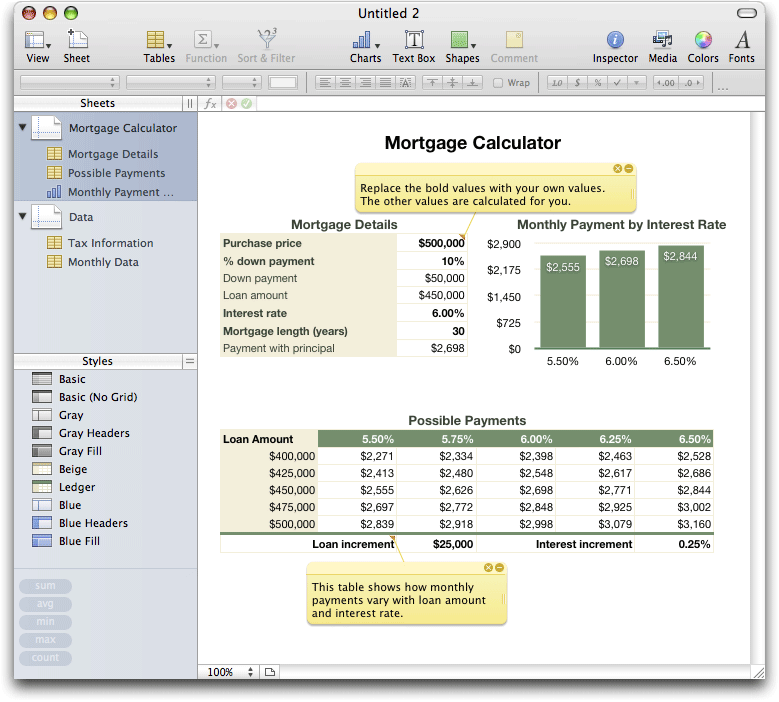 With the release of the still-$79 iWork ’08 , Apple has plugged the spreadsheet hole with Numbers. 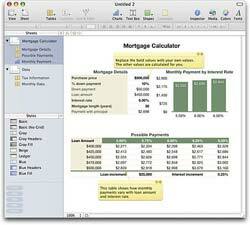 Since Numbers is part of iWork, it shares many features with both Pages and Keynote. There’s the familiar Inspector window; a toolbar with buttons for View, Charts, Shapes, Media, Colors, and Fonts; and a work area with a left-hand sidebar and an open area on the right. It also shares the super-useful contextual format bar, which is sort of like the most-used portions of many of the Inspector tabs, all laid out in a thin strip whose features change depending on what item (or items) you have selected in the work area. So instead of having to visit three inspector tabs to change the settings on a block of text, you can do it all with a quick run across the contextual format bar. But what else does this new application offer? Let’s take a closer look at how Numbers handles spreadsheets. Like Pages when it first debuted, Numbers really changes the paradigm for spreadsheet work. For decades, every spreadsheet program has been basically identical: you get a grid of rows and columns on screen, and you place your numbers and text inside those cells. Over time, we gained the ability to store multiple sheets of these grids within one workbook, and to use formulas to refer to items on one sheet from another. But at the end of the day, the basic work area in a spreadsheet application is a grid of cells… unless you’re using Numbers. 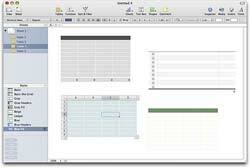 Numbers’ basic work area is a sheet, much like any other spreadsheet app. But that sheet is (potentially) blank when you start; it’s not filled with a grid of rows and columns. You then add tables to the sheet, and each table can have its own associated style. So instead of having a workbook filled with a collection of sheets, a Numbers document consists of any number of sheets, each of which can then have any number of tables on that sheet. Tables are objects, and like a circle or a square or a box of text, can be positioned anywhere on the sheet. As an example, the image to the right (click it for a larger view) shows a document I created showing four tables, each with a different applied style, on one sheet. As seen in the screenshot, only the active table shows the typical row and column headings. This flexible positioning overcomes one of the biggest hassles of traditional spreadsheets: trying to make your document look good when printed. In Excel, it takes lots of messing with row and column heights and widths, and text that spans cells, to make everything line up just the way you want it. In Numbers, it’s a non-issue, as you can just use a new table, and position it exactly where you want it to appear. The other big difference is Numbers’ support for graphics and shapes. In Microsoft Excel, graphics often seem like an after-thought; you can work with them, but the process is complicated, and it takes some effort to get things just how you want them. In Numbers, though, you’ve got the standard iWork graphics capabilities. You can add easily add and position shapes, add drop shadows and borders to various objects, and even add photos, sounds, and movies directly to your document through the Media browser. Before my unexpected career change, I was very much a Finance geek—undergraduate and graduate degrees in Finance, and years in the corporate finance groups for IBM and Apple, amongst others. To put it another way, I made my living in VisiCalc, Lotus 1-2-3, and Excel for a very long time. And I’d be lying if I said the adjustment to Numbers’ new paradigm has been easy in these first 24 hours. In fact, I’d liken it to trying to learn German from a native Japanese speaker within the confines of a Russian language immersion school! The way Numbers works goes against nearly 20 years of training, so I really have to try not to “think Excel” when using the program. That’s not a slam on Numbers at all, though—just a caution that if you’re a heavy Excel user, you might find it takes some time to understand how Numbers works. That said, this new approach is incredibly powerful, and you can build some amazing documents using the flexibility it provides. One of the things that kept me employed for many years was my ability to not only work with the financial side of Excel, but to create professional looking, easy-to-read reports directly from Excel. As noted above, this isn’t an easy thing to do, and it was where much of my time was spent, after making sure my basic model worked. It’s a good thing I went through a career change, because Numbers has put an end to much of that effort with its supplied templates. Need a report that compares a bunch of alternatives, in a format suitable for showing to The Boss? Just pick the Comparison template. Need a nice looking report on the affordability of that new mortgage you’re considering? Pick the Mortgage template, and all the work’s done for you, as you can see in the image (click for a larger version). Now, to be fair, Excel has templates as well. But in comparing the two, Numbers really shows the strengths of its flexible layout and better graphics support. In all my years of using Excel, I would occasionally use a template as a starting point, but the final product would never look anything like the stock template. Numbers’ templates, on the other hand, look good enough to use as is and would require almost no tweaking. The heart of any spreadsheet is how well it works with data, and Numbers seems to handle this task well. There are roughly 165 formulas—about 100 fewer than you’ll find in Excel, but there are enough available to meet the needs of most spreadsheet users. Numbers also brings some new features to the table. A super-simple Sort & Filter dialog lets you easily sort any table, and filter what data is shown based on conditions you apply. You can format a number in a cell as a stepper, a slider, or a pop-up menu. Steppers let you easily increase or decrease a number one step at a time (and you can define the size of the “step”); sliders do the same thing but on a larger, faster scale; and a pop-up menu lets you set the cell’s value by using a pop-up menu (shocking, I know!). If you’re working on spreadsheets with a fair amount of variability, these new methods of easily changing values are a big time-saver. Another nice data handling feature is the Checkbox table. Add a table of checkboxes, and you can then easily enable or disable the inclusion of a given number in a sum, for instance, by using the SUMIF function to only include values that have been checked (or not checked). Like Keynote and Pages, great-looking charts are easy to create in Numbers. Just select the data to be charted, tell the program what type of chart you’d like to see, and then let it do the hard work. If you’re using a template, the chart’s colors and textures will be pre-chosen to match the rest of the template, though they can be easily changed. Compared to Excel, however, Numbers falls short, especially in the more technical area. There are but nine basic chart types, and you won’t find Radar, Bubble, Stock, or Doughnut among the choices. Users with heavy-duty charting needs may find that Numbers doesn’t let them do everything they need to do. If you don’t need complex charts, however, you’ll find that Numbers’ charts are easy to create and amazingly nice looking. While this is a useful tool, the really useful information is visible on the imported workbook itself. Any cell that imported with an error will have a small blue triangle in the upper left corner. Mouse over that triangle and hover for a second, and Numbers will display a message explaining exactly why it couldn’t import that cell—incompatible formatting, or a non-supported formula, for instance. If it’s a non-supported formula, it will even show you the original formula, which eases the task of trying to come up with a replacement. Most of the compatibility issues are caused by Numbers’ lack of support for all of Excel’s formulas. In my worksheets, most of the problems were caused by by a handful of formulas. For instance, I use OFFSET() in Excel to grab a cell value relative to location. Numbers has no apparent equivalent, and thus converts the formula into a value. Similarly, INDIRECT() can be used to reference a cell based on a value in another cell, and it also caused an error in Numbers. The other big problem area is macros: Excel supports them, and Numbers doesn’t. So if your Excel spreadsheet uses macros, you’ll have to recode it to work without those macros if you want to convert it to work in Numbers. I have a number of worksheets, including one I use weekly with Macworld , that rely on macros. It will take some time to see if there’s a workaround using Numbers’ other features or not. For most “typical” spreadsheet users, however, import and export should work just fine. My simpler documents all opened perfectly, or with only slight visual changes. I was then able to modify the file, save it, and open it again in Excel. It’s only those of us who rely on some of the more esoteric Excel functions and macros who will experience troubles with importing Excel documents. 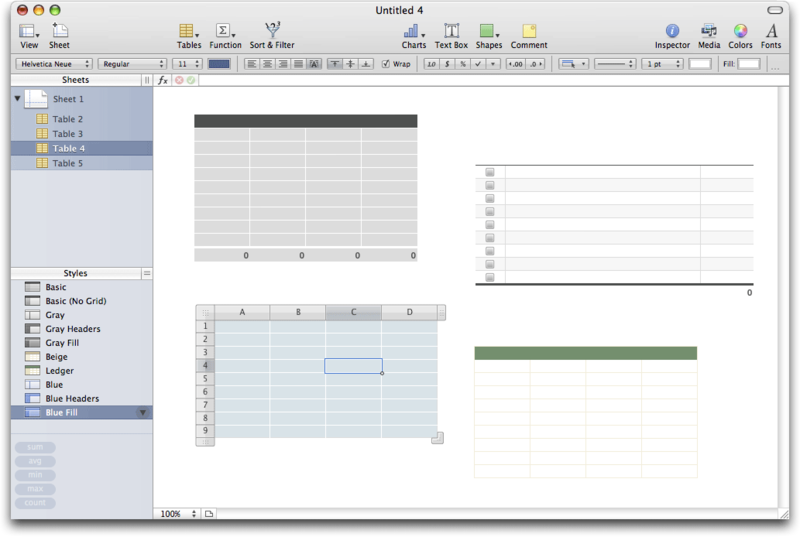 I think Apple’s new approach to spreadsheets is going to be quite successful, at least based on my initial hands-on time. The program is fast, the features are well thought out, and the new paradigm that Apple has applied to the staid old spreadsheet application solve many of the frustrations that we’ve come to accept with those traditional programs. We’ll have more definitive thoughts about Numbers and its features in Macworld’s full review of the application. This article was reposted at 11:30 p.m. Eastern on August 8, 2007 to correct an error regarding how Numbers reports details on errors in imported Excel workbooks.